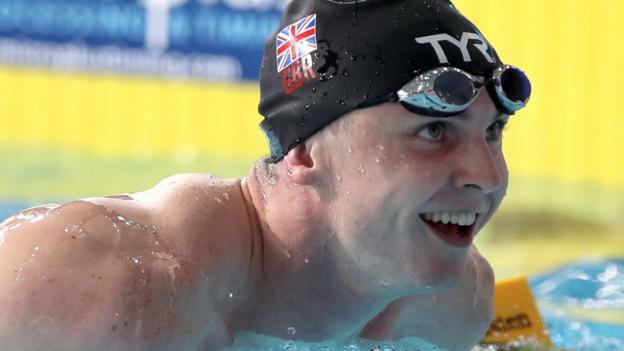 Britain’s Ross Murdoch and James Wilby eased through to the semi-finals of the men’s 200m breaststroke at the European Championships in Glasgow. Murdoch and Wilby set the fifth and sixth fastest times respectively in Sunday morning’s heats. Elsewhere, Commonwealth Games silver medallist Duncan Scott missed out on the 200m individual medley semi-finals. He set the third fastest time in the heats but fellow Britons Mark Szaranek and Max Litchfield were quicker. Only two swimmers from each nation can progress to the semi-finals. In the women’s 200m butterfly heats, Commonwealth Games champion Alys Thomas set the fastest time to qualify for the semi-finals, where she will be joined by Emily Large. Luke Greenbank and Brodie Williams are into the men’s 100m backstroke semi-finals while Holly Hibbott and Ellie Faulkner progressed in the women’s 200m freestyle. Britain’s men’s 4x200m freestyle relay quartet – Stephen Milne, Cameron Kurle, Thomas Dean and Calum Jarvis – qualified second fastest for Sunday night’s final behind Russia.